Having joined the music faculty of the University of Louisiana at Lafayette in 2015, Scott Durbin brings a history of accomplishment, work experiences in the music and entertainment industries, and background as an educator in the public and private sectors to his position as Instructor and Coordinator for the Music Business program. Best known as the founder of the Imagination Movers, Scott collaborated to bring a music-based idea from concept to global brand, exemplified by the award-winning, eponymous television series seen on the Disney Channel. 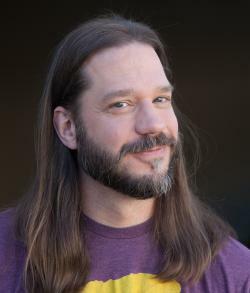 As co-executive producer and principal actor of over 75 episodes, Durbin also co-wrote the music heard on the show, receiving an Emmy award for Outstanding Original Song in Children’s and Animation from the National Academy for Television Arts and Sciences. In particular, he has co-written over 150 original compositions with song licenses to The Ellen DeGeneres Show, Wipeout, and The Today Show, received fourteen national awards, and co-authored a Movers song book for piano/vocal/guitar through Hal Leonard Corp. Along with selected television interviews and performances that include Good Morning America, The View, NY1, Breakfast Television – Canada, ABC News Now, and radio interviews and performances on NPR’s “American Routes,” “Morning Edition,” SiriusXM and Radio Disney, Scott has performed for two presidential administrations, toured nationally and internationally, and graced the cover of Pollstar magazine. Notable concert appearances include Austin City Limits Music Festival, John F. Kennedy Center for the Performing Arts, New Orleans Jazz & Heritage Festival, Sheikh Rashid Hall, DWTC, Dubai , Bloomsbury Theatre UK and Voodoo Music Festival. From a ‘Do It Yourself’ beginning to negotiating recording and television contracts with Disney and Razor & Tie, publishing and writing deals, planning large-scale tours, managing sponsorship deals (American Express, Sony, Chick-fil-A, BlueCross BlueShield), dealing with publicists and artist management firms (The Collective and Red Light Management), partnering with major merchandising companies (FEA and Bravado), Scott has amassed a substantial amount of real-world experience, networking, and practical knowledge within an ever-changing music industry. Scott also has ten years of instruction in both public and private sectors, twice being recognized as Teacher of the Year. Scott received a bachelor of arts degree from Centenary College of Louisiana. His graduate course work includes completing his alternative certification from the University of New Orleans. He also continues to work with the Imagination Movers, recently partnering with the Canadian production company 9-Story Media Group to develop an animated/live-action series called Super Movers.